May 7, 2018, 2:17 PM · Congratulations to the New York City-based Aizuri Quartet, which has won the $100,000 M-Prize, announced Sunday at the the third annual M-Prize chamber music competition! The M-Prize is hosted by the University of Michigan's School of Music, Theatre & Dance and took place in Ann Arbor, Mich. May 3-5. 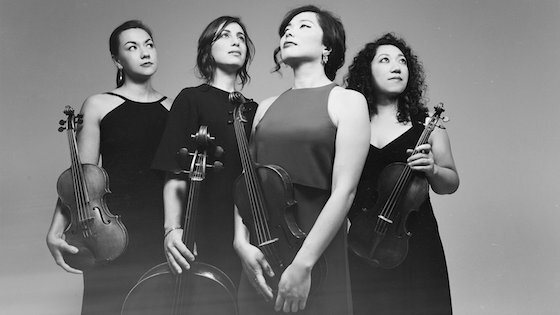 The Aizuri Quartet, formed in 2012, consists of violinists Ariana Kim and Miho Saegusa, violist Ayane Kozasa and cellist Karen Ouzounian. The quartet has won a number of prizes, including First Prize at the 2017 Osaka International Chamber Music Competition in Japan, and Third Prize at the 2015 Wigmore Hall International String Quartet Competition in London. This season they also have been the MetLiveArts String Quartet-in-Residence at the Metropolitan Museum of Art. BELOW: Aizuri Quartet performs Haydn String Quartet Op. 20 No. 2 in C Major, at the Curtis Institute of Music's "Curtis Presents" in Philadelphia, PA on December 8, 2017. 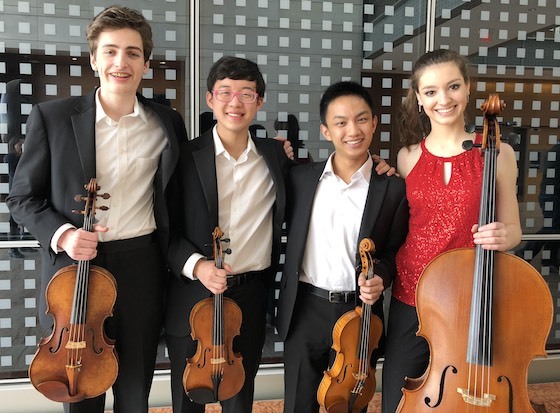 The Kairos Quartet, from the Music Institute of Chicago Academy, won Junior Strings First Prize. The M-Prize competition was created in 2016 by Michigan School of Music, Theatre & Dance Dean Aaron Dworkin to identify and showcase chamber music talent. The 2018 M-Prize competition featured 34 ensembles from across the United States as well as France, Austria, The Netherlands and the United Kingdom. Including the grand prize, more than $200,000 in prize money was distributed among the top three winners in three different categories: strings, woodwinds and open, in Junior (ages 18 and under) and Senior (ages 19-35) divisions. Last year's grand prize was awarded to Russian Renaissance; and the 2016 M-Prize went to The Calidore String Quartet. This year's Strings jury included pianist Winston Choi; cellist Alexander Hülshoff and violin/violist Kathryn Votapek. May 8, 2018 at 06:12 AM · Congratulations to the Aizuri String Quartet! I was introduced to them when I took an on-line course on the (topic of the) string quartet taught by Arnold Steinhardt. They played whenever he wanted to illustrate an entire movement. I believe he mentored them when they were starting out. May 10, 2018 at 01:43 AM · @Francesca - that was my first exposure to them too. It must have been great having Arnold looking over your shoulder. I think the second violinist in the course moved on, and the then-first violinist has now moved to second violin when the current first violinist joined. Looks like the change didn't hurt! Congratulations to them and I hope they continue to do well. May 10, 2018 at 02:49 PM · Hi, John. I thought it wasn't the original line-up. I guess the only thing it "hurts" is the story behind their name, which is a combination of the names of the original members.